It isn't often I am taken by surprise at my findings in Boots. 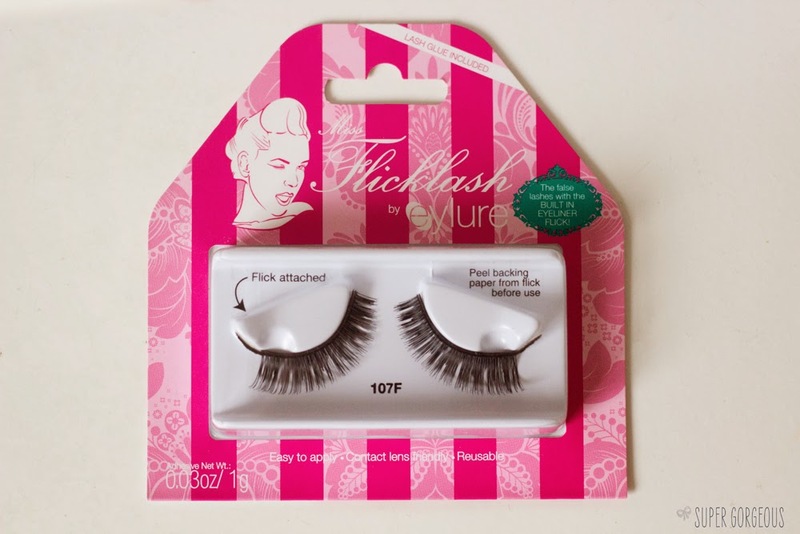 Until I saw Miss Flicklash lashes by Eylure - false lashes with the eyeliner built into the lash. Something I had never contemplated needing, but nevertheless, I felt compelled and intrigued to buy a pair to see how they turned out, plus they were reduced to £2.46 or something like that, so it almost would have been rude not to. I picked up the lashes in style 107F - a textured set which would give length and a slight bit of fullness to my lashes. From what I can tell, there are 4 different styles in this range, varying from much more natural, to super-full on. 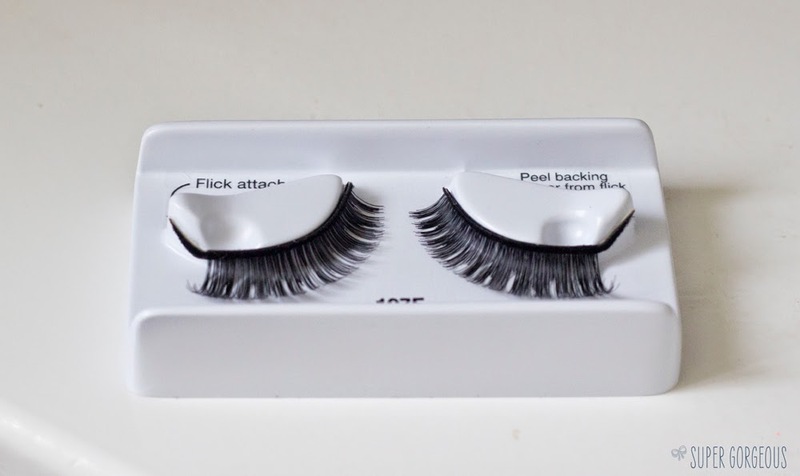 The Flicklashes are easy to apply - you do as you would with regular lashes, expect with these you peel the backing paper off the flick and also apply glue to that. You make sure your falsies are in the right spot, then secure down the flick, which is pretty easy to position - it's fairly stiff so you won't end up with wonky wings. The lash band is quite thick, to give the impression of eyeliner for the flick to continue into. I found I needed to add some black liner into the inner corner of my upper lash-line to make them blend in. When I first saw these in the shop, I did an internal laugh, thinking it was a bit of a crazy idea - but you know what? I take it all back. What a genius idea for anyone that struggles with liner - it ensures it's the perfect shape, balance and in the perfect position, and looks really effective. What do you think? If you like the look of them, have a look at the lash section of your local Boots - you may be able to get them at a clearance price too - or does the fact that they are clearance mean they are getting discontinued? Who knows, but grab them while you can! If not they are available at the Eylure website. When I saw the first photo of them I admit I thought this will never work and they'll probably look ridiculous but actually I take it back and they do look amazing, you'd never know that the eye liner wasn't real!